Organizational structure involves, in addition to task organizational boundary considerations, the designation of jobs within an organization and the relationships among those jobs. There are numerous ways to structure jobs within an organization, but two of the most basic forms include simple line structures and line-and-staff structures. In a line organization, top management has complete control, and the chain of command is clear and simple. Examples of line organizations are small businesses in which the top manager, often the owner, is positioned at the top of the organizational structure and has clear "lines" of distinction between him and his subordinates. 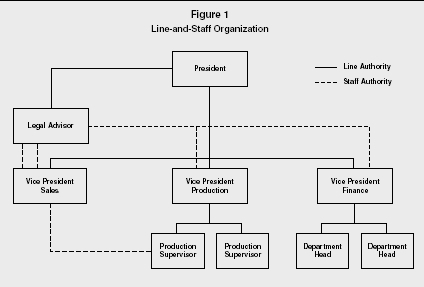 The line-and-staff organization combines the line organization with staff departments that support and advise line departments. Most medium and large-sized firms exhibit line-and-staff organizational structures. The distinguishing characteristic between simple line organizations and line-and-staff organizations is the multiple layers of management within line-and-staff organizations. The following sections refer primarily to line-and-staff structures, although the advantages and disadvantages discussed apply to both types of organizational structures. Several advantages and disadvantages are present within a line-and-staff organization. An advantage of a line-and-staff organization is the availability of technical specialists. Staff experts in specific areas are incorporated into the formal chain of command. A disadvantage of a line-and-staff organization is conflict between line and staff personnel. A wide variety of positions exist within a line-and-staff organization. Some positions are primary to the company's mission, whereas others are secondary—in the form of support and indirect contribution. Although positions within a line-and-staff organization can be differentiated in several ways, the simplest approach classifies them as being either line or staff. A line position is directly involved in the day-to-day operations of the organization, such as producing or selling a product or service. Line positions are occupied by line personnel and line managers. Line personnel carry out the primary activities of a business and are considered essential to the basic functioning of the organization. Line managers make the majority of the decisions and direct line personnel to achieve company goals. An example of a line manager is a marketing executive. Although a marketing executive does not actually produce the product or service, he or she directly contributes to the firm's overall objectives through market forecasting and generating product or service demand. Therefore, line positions, whether they are personnel or managers, engage in activities that are functionally and directly related to the principal workflow of an organization. Staff positions serve the organization by indirectly supporting line functions. Staff positions consist of staff personnel and staff managers. Staff personnel use their technical expertise to assist line personnel and aid top management in various business activities. Staff managers provide support, advice, and knowledge to other individuals in the chain of command. Although staff managers are not part of the chain of command related to direct production of products or services, they do have authority over personnel. An example of a staff manager is a legal adviser. He or she does not actively engage in profit-making activities, but does provide legal support to those who do. Therefore, staff positions, whether personnel or managers, engage in activities that are supportive to line personnel. Authority within a line-and-staff organization can be differentiated. Three types of authority are present: line, staff, and functional. Line authority is the right to carry out assignments and exact performance from other individuals. Line authority flows down the chain of command. For example, line authority gives a production supervisor the right to direct an employee to operate a particular machine, and it gives the vice president of finance the right to request a certain report from a department head. Therefore, line authority gives an individual a certain degree of power relating to the performance of an organizational task. Two important clarifications should be considered, however, when discussing line authority: (1) line authority does not ensure effective performance, and (2) line authority is not restricted to line personnel. The head of a staff department has line authority over his or her employees by virtue of authority relationships between the department head and his or her directly-reporting employees. Staff authority is the right to advise or counsel those with line authority. For example, human resource department employees help other departments by selecting and developing a qualified workforce. A quality control manager aids a production manager by determining the acceptable quality level of products or services at a manufacturing company, initiating quality programs, and carrying out statistical analysis to ensure compliance with quality standards. Therefore, staff authority gives staff personnel the right to offer advice in an effort to improve line operations. Functional authority is referred to as limited line authority. It gives a staff person power over a particular function, such as safety or accounting. Usually, functional authority is given to specific staff personnel with expertise in a certain area. For example, members of an accounting department might have authority to request documents they need to prepare financial reports, or a human resource manager might have authority to ensure that all departments are complying with equal employment opportunity laws. Functional authority is a special type of authority for staff personnel, which must be designated by top management. Due to different positions and types of authority within a line-and-staff organization, conflict between line and staff personnel is almost inevitable. Although minimal conflict due to differences in viewpoints is natural, conflict on the part of line and staff personnel can disrupt an entire organization. There are many reasons for conflict. Poor human relations, overlapping authority and responsibility, and misuse of staff personnel by top management are all primary reasons for feelings of resentment between line and staff personnel. This resentment can result in various departments viewing the organization from a narrow stance instead of looking at the organization as a whole. Fortunately, there are several ways to minimize conflict. One way is to integrate line and staff personnel into a work team. The success of the work team depends on how well each group can work together in efforts to increase productivity and performance. Another solution is to ensure that the areas of responsibility and authority of both line and staff personnel are clearly defined. With clearly defined lines of authority and responsibility, each group may better understand their role in the organization. A third way to minimize conflict is to hold both line and staff personnel accountable for the results of their own activities. In other words, line personnel should not be entirely responsible for poor performance resulting from staff personnel advice. Line-and-staff organizations combine the direct flow of authority present within a line organization with staff departments that offer support and advice. A clear chain of command is a consistent characteristic among line-and-staff organizational structures. Problems of conflict may arise, but organizations that clearly delineate responsibility can help minimize such conflict. Hitt, Michael, Stewart Black, and Lyman W. Porter. Management. Englewood Cliffs, NJ: Prentice Hall, 2004. Jones, Gareth R. Organizational Theory, Design, and Change. Upper Saddle River, NJ: Prentice Hall, 2004. Judge, Timothy A., and Herbert G. Heneman, III. Staffing Organizations. Boston, MA: McGraw-Hill-Irwin, 2006. Young, Gary J., Martin P. Charns, and Timothy C. Heeren. "Product-Line Management in Professional Organizations: An Empirical Test of Competing Theoretical Perspectives." Academy of Management Journal 47, no. 5: 723–735. A clear and comprehensive writeup,very easy to understand.thanks.